With Smile Reminder's recare system, practices receive an immediate response from patients, either by an appointment request through e-mail or by a phone call to request an appointment. Smile Reminder, a comprehensive patient communication service, provides dental professionals with much-needed help to keep patients happy and revenues flowing during these tough economic times. 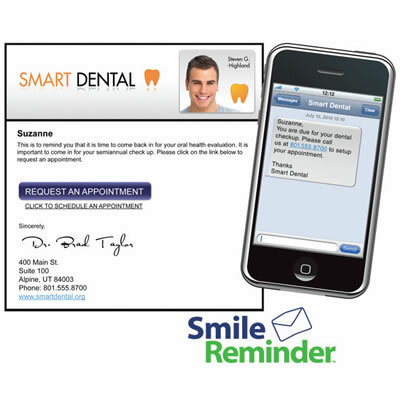 Generating over $500 million through its recare feature (reminders to patients that they are due for some type of continuing care appointment) alone, Smile Reminder provides dental professionals with a new and effective way to build and maintain revenues. With the average dental practice experiencing declines in revenues, reactivating lost patients is critical. Smile Reminder allows a practice to maximize the reminders to patients, while minimizing the amount of time that process takes.